Inside the eye there is a natural lens like the lens of a camera. When we are born the lens is clear like glass. Over the years, the lens can lose its clarity, and vision is reduced. A lens which has lost its ability to clearly transmit light is called a CATARACT. Cataracts are one of the most common causes of reduced vision in the world. Cataracts can occur at any age, but most cataracts develop after age 60. Most patients suffering from cataracts will have noticed that their vision is becoming hazy. Some report trouble with glare, particularly when driving at night. When should the cataract be removed? Some patients have small cataracts and may not yet experience any symptoms. These patients usually do not require surgery. Patients who have cataracts impairing the quality of their vision may be advised that surgery could improve their vision. 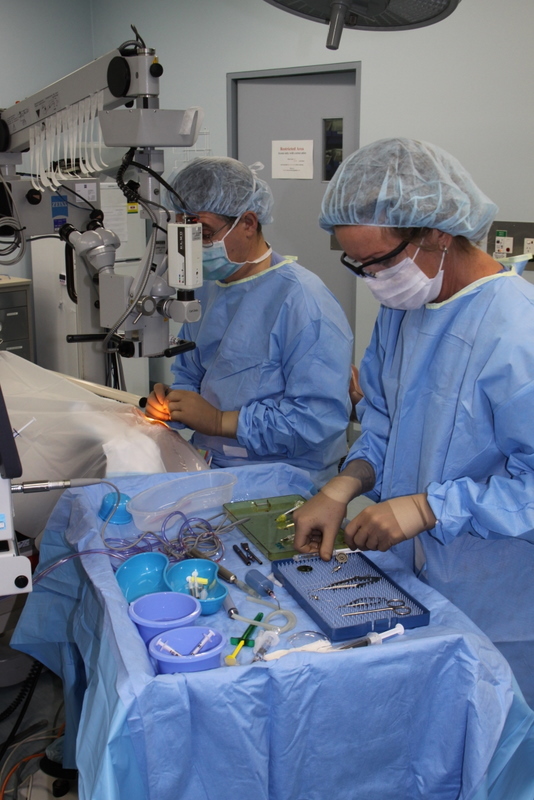 Cataract surgery is usually performed as an elective day surgery procedure. In rare cases, if the cataract becomes very advanced, it can "leak" or" expand" and cause glaucoma. In these cases, cataract surgery has to be performed urgently. In childhood, cataract surgery may be promptly required to prevent a "lazy eye" developing. At the Cataract Clinic of Victoria, cataract surgery is performed on site in the Melbourne Day Surgery. Most patients spend 2 hours in the centre on the day of treatment. Most patients can resume normal activities the next day. Will I need to be put to sleep with an anaesthetic? No. It is now rare to need a full anaesthetic. Most patients have only their eye put to sleep with anaesthetic drops, a small amount of anaesthetic over the iris, and mild intravenous sedation. Some patients also choose to have the eye socket area numbed with an anaesthetic block. Will I need an eye patch after surgery? Usually not. With the newer anaesthetic techniques, an eye patch is usually not needed after surgery. Most working people choose to have the day off work. I have private health insurance; will I have to pay anything? Usually there is a gap fee for the doctors’ charges, but no gap fee for use of the day surgery. The laser technology equipment and disposables are not covered by insurance companies. We try hard to keep out of pocket charges low, and tell you exactly what they will be before booking your operation. If I don't have insurance, can I still have cataract surgery at the Cataract Clinic of Victoria? Yes. You can still have the personalised care and certainty of your choice of surgeon, and avoid the waiting lists of public hospital treatment. Will I need to be checked after the operation? You will be reviewed in the clinic the next day, and after one week. You will also need to have your eyes examined and re-tested for glasses after one month. Will I need eye drops? Yes. You will have eye drops to use four times daily, starting a few days before surgery. Will I need Laser treatment after surgery? Possibly. Many patients develop some clouding of the natural membrane behind the implant in the months or years after cataract surgery. This is then removed in the clinic using a painless laser treatment taking only a few minutes. The treatment is called a YAG laser capsulotomy.